If you’ve ever had a tough time navigating a big public school system, you’re not alone. Parents in the Boston Public School system often face confusion around who to contact with questions and where they should even start—which phone number, website, or office contact should they use? But it doesn’t have to be a big hassle! Our team of 5 Harvard students spent 12 weeks diving into the Boston Public Schools system and researching the family experience. We finished the semester with the opportunity to pitch the folks in charge—the executive suite at Boston Public Schools—with our suggestions for how to improve that experience. After over 50 user interviews, we learned firsthand from students and families just how much clear, consistent and easy to access information matters. One student—call her Letisha—had a new legal guardian who needed to approve school paperwork for the coming year, but the system didn’t yet have the new guardian on file, and instructions on the website indicated the process had to be verified in person. She took time off school, caught two city buses, and traveled several hours in order to reach central headquarters, only to uncover a huge setback: She didn’t have all of the necessary forms filled out and ready to make the guardianship transfer official. Solving her problem would mean more buses and more time out of her schedule—and it doesn’t have to be that way. If families can find answers or make considerable progress on the first try, everyone has a better experience. Parents and guardians try several ways to find those answers—online, by talking to school staff, and by talking to other parents. Once they find a method that works, that’s where they’ll start the next time they have an issue. And as we learned, Boston Public Schools has several teams working hard to answer incoming questions—but even inside headquarters, getting the right information depends on having relationships with people in other departments. How do we make sure someone like Letisha has the right forms before she travels for hours on bus? Can she avoid that journey completely? How can we help families and staff navigate the complexities of the Boston Public Schools system? We envision the Boston Public Schools (BPS) making continual improvements. If BPS can help families help themselves by providing the information they seek more effectively, it could reduce the number of incoming phone calls and free up time for the BPS staff team to use in other areas—like building relationships across departments, or giving more attention to families with more complex questions. The Boston Public Schools updated their website midway through the semester—and our team took the opportunity to think through ways to help BPS capitalize on and push forward this positive momentum. 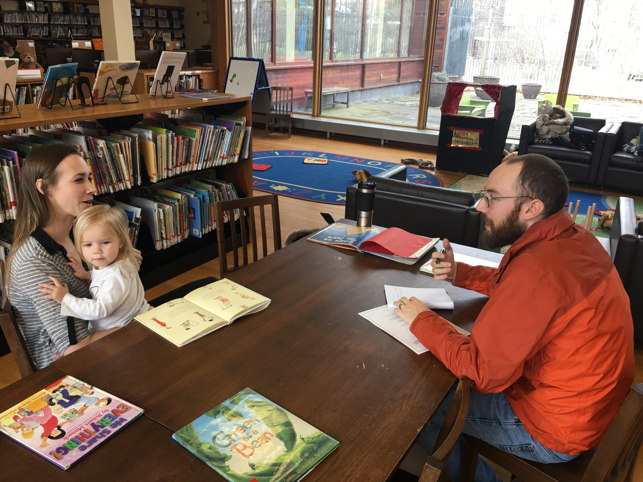 We went to welcome centers and libraries and coffee shops around Boston to find parents and watch the way they used the current website. These field tests helped us understand how people look for information, and where they get stuck. Some behaviors were very common— like prompting a search when a parent has typed in a question into a search box and pressed the enter key. Based on our learnings, we sketched out a couple mockup designs, aiming to make a simple, fast-loading landing page, with prominent links to the most-used sections of the website. We took some educated guesses with our prototype, but the important thing was not the specific layout so much as the approach—fixing the things that make customers stumble, and listening to how real people use the website. 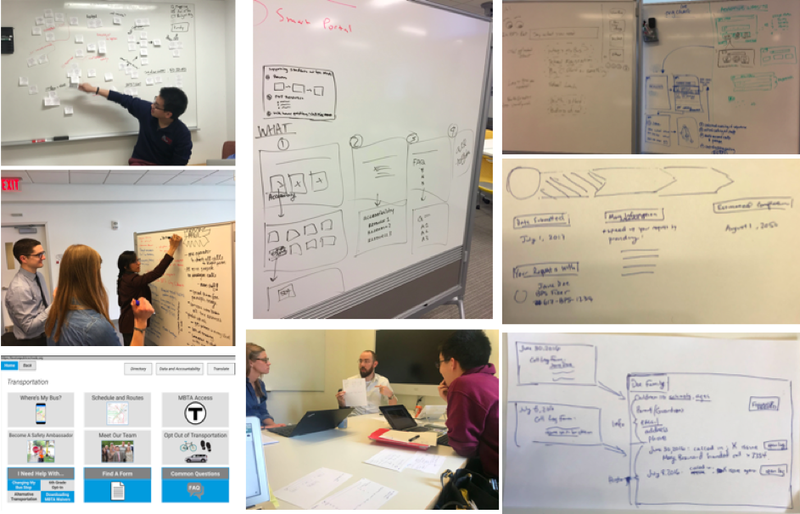 Below is the final mock-up after whiteboard brainstorming, paper prototypes, testing with users, additional prototyping, additional user-testing, then finally developing a higher fidelity prototype, the team culminated on the below screens. This prototype incorporated our three recommendations. Design the website to clearly explain only the necessary information, and target it towards parents and families who may not have an intimate understanding of the educational system. Orient key information based on how families search. There are a few basic things we learned that parents search for—forms, questions, school bus times, etc. These are the objects around which a website flow can be designed. Small changes to the website will encourage customers to come back to the website when they have questions in the future, rather than call BPS because they feel confused. We also had recommendations to BPS that focused on internal information sharing, including continuing to test and scale internal systems (like a customer relationship management system) and processes that will make it easier for BPS staff to help parents. It’s our hope that the next time you need an answer from the Boston Public Schools, you’ll be able to easily find it online, which will hopefully put a smile back on your face. We are a student team at Harvard working with the Boston Public Schools to understand and improve the parent experience—yet none of us have children! To understand how parents experience the Boston Public Schools (BPS), we needed to do a little fieldwork. We went out into Boston to talk with parents in their neighborhoods. John walking the streets in Dorchester, where he grew up, on a frigid February day—starting at the bus stop he used to take to school near Codman Square library, followed by stops in convenience stores and laundromats near Ashmont Station. Molly calling parents who had previously contacted Carolyn MacNeil, the BPS ombudsperson. Ayna and Ben attending the Boston Schools Committee meeting in Roxbury, canvassing parents on the streets of Allston, and speaking with parents who attend Harvard Kennedy School. Chris stopping by the Josiah Quincy school in Chinatown and talking with parents waiting to pick up kids at the end of the school day. We quickly found that parents and guardians care deeply about the public schools. One grandmother stood in the freezing cold for twenty-five minutes to talk about her son being bullied. Many parents wept as they expressed their frustrations. Their stories reminded us that when a kid boards a school bus, their parents’ hearts go with them. We talked to twenty-five parents, some for over an hour. Some parents reported their initial worries turned into love of their local school and teachers. Other parents felt pretty good about their school, until they hit a problem. We heard about fourth-graders who suddenly fear math, middle school students with disappearing homework, and parents trying to get their child’s medical needs recognized in high school. Some parents had already resolved their concerns, but many talked about big life changes they had considered—homeschooling, charter schooling, or even moving the whole family—just to switch schools. Parents who felt their principal wasn’t listening to their concerns often decided “I have to go over their head.” For our team, that’s an important learning: Parents aren’t starting out bringing every problem to the BPS administration. They’re going first to the school, then escalating. By the time they first get to a BPS employee, they are often already frustrated. Parents want to reach someone who will listen, and address their concerns. Both parts are important! When people think of schools, they probably think of teachers, students, tests, and homework. People rarely think about parents — but they should. For parents, it can be an emotional experience to entrust their child to the care of others. A good parent experience builds trust, while bad experiences often leave parents anxious and upset. How can BPS ensure equitable, quality service to all of its parents? An emphasis on parent service may seem out of place in a public school system, but it can have a direct effect on the level and equity of students’ academic achievement. In an educational setting, good service towards parents help secure transportation and special education accommodations for their children, ensures that families have equitable access to district services, and strengthens relationships across silos, keeping employees engaged and reducing costly turnover, freeing up resources for classroom teachers. On any given day, effective customer service may be the difference between successful tag-teams and endless phone tag. And over the course of a child’s education, it can be the difference between loving your school system and feeling like it drives you crazy. As outsiders to Boston Public Schools, we recognize the importance of practicing empathy and building an intimate understanding of the issues that parents and other BPS customers face through user interviews and focus groups. Equally important will be understanding the people and processes that guide BPS. We plan to learn about the system as it currently exists by speaking with district officials, administrators, and school leaders, reading secondary research, and analyzing administrative data to probe for weaknesses and areas for potential improvement. We have come to this project through the Harvard Kennedy School course on Technology and Innovation in Government, taught by Professor Nick Sinai. Five cross-disciplinary teams will conduct user research and use design thinking to address pressing public sector problems for clients in the U.S. Census Bureau, the U.S. Department of Veterans Affairs, the Boston Public Schools, and the City of Boston. The Boston Public Schools team is composed of four Harvard Kennedy School graduate students and one Harvard College sophomore. We bring a diverse set of experiences and skills to this project, but common among us is our passion for equitable, high quality systems of education. Ayna Agarwal is a Masters student at the Harvard Kennedy School, focusing on deploying technology and innovation to improve the public sector. She is the Co-Founder of she++, a global movement that aims to increase diversity in the technology sector. She began her career in the Silicon Valley, where she worked with various start-ups and growth-stage technology firms. Most recently she was at Palantir Technologies. Chris Kuang is a sophomore at Harvard College studying Applied Math and Economics. He channels his passions in civic engagement and public policy in his work as co-founder and Director of Coding it Forward, a grassroots nonprofit that empowers students to use their technology skills to create social impact. His previous education experience includes advocating for students as the first-ever student representative to the Winchester (MA) School Committee and working with K-6 students. Ben McGuire is a Masters student at the Kennedy School with professional background in education research, political organizing, and data analytics. Ben's work in education has included best practice research on cybersecurity and data analytics in higher education as well as closing the achievement gap and improving career and technical education in public K-12 districts. John La Rue is a Dorchester native and a Mid-Career Masters in Public Administration candidate. He worked for the Obama ‘08 campaign across six states and in Nevada state politics through 2010. Since 2010, he has lived in Washington D.C. and worked as a speechwriter at the Office of Personnel Management and the U.S. Department of Energy.